We understand that you have questions. Here are some of the frequently asked questions that we receive each year. What is a claims-made and reported policy? A claims-made and reported policy means the coverage is limited to only those Claims that are first made against you and reported to the Company while the policy is in force. The CAMICO insurance policy is a ‘claims made and reported’ policy. The insurance applies only to Claims that are first made and reported to CAMICO during the Policy Period, or that are first made and reported to the Company during an ‘Extended Reporting Coverage’ period, if purchased. A 60-day grace period follows the expiration of a Policy Period. After the grace period, limited coverage ($100,000 sub-limit, in excess of the per claim deductible, or 50% of the per claim limit of liability, whichever is less) is provided for claims not reported within the Policy Period or grace period but are reported during the immediately succeeding policy period, and the insured has continuously maintained the policy during that 12-month period. CAMICO’s Continuity of Coverage for Potential Claims provides protection and helps eliminate coverage gaps for potential claims known to an insured while coverage is consecutively renewed with the CAMICO program. This feature maintains coverage for potential claims that were not timely reported by policyholders who continuously renew their policies with the CAMICO program. The Retroactive Date, stated in the policy’s Declarations, is the earliest date from which the policy provides coverage for Professional Services, sometimes referred to as “prior acts coverage.” Claims arising from acts, errors or omissions that occurred prior to the policy’s Retroactive Date (or the “prior acts date”) will not be covered by the policy unless specifically included. What is limit of liability? •	Per-claim. The maximum amount of liability protection an insurer will pay for any one claim. •	Aggregate. A professional liability policy issued with an aggregate limit reflects the maximum liability for all claims during the policy term. Each defense and indemnity payment that is made reduces the aggregate limit of liability. •	Separate limit of defense. Coverage in which the expense limit is a separate and distinct limit from the indemnity limit. For example, a policy might have a $200,000 separate defense limit and split limit of $1 million / $2 million. In cases where this option is offered, once the separate defense limit is exhausted, defense expenses will then be paid out of the indemnity limit. •	Expense outside of the limit. Some states require insurers to offer optional limit coverage, stated on the declaration page, whereby the expense limit is outside the policy limit. This is particularly true for policies with low limits of liability. This type of policy provides no cap on the amount of money paid to defend a firm. Therefore, the only kind of payment that applies to the policy limit is an indemnity payment. The following table shows examples of policy limits, costs of a claim, and remaining limits available for subsequent claims after indemnity and defense costs shown are paid. Note that the claims amounts paid are limited by both the per-claim amount and the policy aggregate amount. What is 'per claim deductible' and 'aggregate deductible'? The deductible is the portion of the covered loss that is paid by the policyholder. The policy will clarify whether the deductible amount paid reduces the limit of liability, or if the limit of liability is in excess of the deductible amount. • Per-claim deductible. The per-claim deductible is applied to each claim made during the policy period and applies to the first money paid on the claim. Many insurance companies pay the defense counsel or indemnify the claimant, and then bill the CPA firm for reimbursement of the deductible amount. Other insurance companies require the CPA firm to pay any claim amounts up to the amount of the deductible. • Aggregate deductible. The aggregate deductible is used with the per-claim deductible to put a cap on the total deductible amount paid out by the CPA firm during the policy term. For example, if the firm has a $5,000 per-claim deductible with a $10,000 aggregate deductible, the firm would pay the full deductible on the first two claims. Thereafter, the firm would not be assessed a deductible for any further claims during the policy term. Thus, the aggregate deductible defines the CPA firm’s maximum exposure for deductibles. What should you look for in an insurance carrier's claims handling? Every carrier has a claims management philosophy, whether it is in a written statement or not. Ask the attorneys who work as defense counsel for CPA professional liability carriers for their assessments of the carrier’s claims handling process and philosophy. Most insurers make sound choices in selecting legal counsel and devising defense strategies, although some carriers may have more expertise in defending lawyers, doctors and design professionals than they do in defending CPAs—and the disciplines are very different from each other. The insurer should have skilled claims representatives on staff willing to work closely with the CPA firm and legal counsel in defending the claim. •	Solve professional liability problems fairly, efficiently and expeditiously with superior services and a personal approach. •	Encourage early notification of situations that could give rise to a claim; in fact, we provide a deductible credit of 50%, up to $50,000, for reporting of a potential claim during the policy period in which it becomes known, or for use of formal mediation to attempt to resolve a claim. •	Provide a proactive defense—not passive and reactionary. Upfront analysis enables the development and implementation of a plan to resolve the matter in a focused manner. •	Employ a team approach that brings together the policyholder, the CAMICO representative and external attorneys and consultants, as required. •	Counsel policyholders on ways to avoid or minimize exposure. How does Extended Reporting Coverage work? CAMICO’s policy, which is a "claims made and reported" policy, applies only to claims that are first made and reported during the policy period. Therefore, claims received after a CPA firm discontinues its policy would not be covered unless Extended Reporting Coverage (ERC), or "tail" coverage, is in place to cover claims. CPAs who are retiring or become permanently disabled, or who cancel or non-renew a policy for other reasons, are generally interested in purchasing ERC. CAMICO’s policy extends the right to purchase ERC to policyholders under specific terms. Sole proprietors and two-professional firms are generally able to purchase ERC from CAMICO under relatively favorable terms—an important feature of the policy. Other firms may also find favorable ERC terms, depending on factors such as policy limits and claims experience. ERC can also be used in certain firm merger and dissolution situations, depending on the circumstances. For more information, contact CAMICO at 1.800.652.1772, or email inquiry@camico.com. How does CAMICO treat expenses incurred for potential claims? 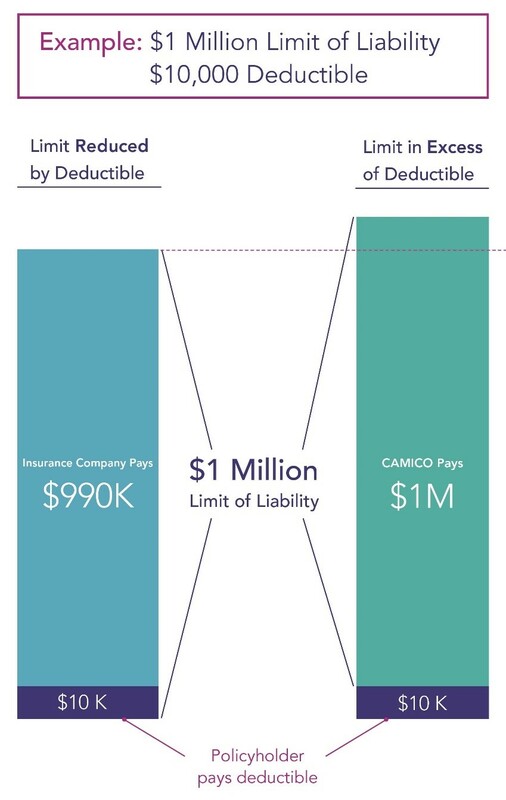 The CAMICO Mutual policy provides that such expenses are not chargeable against the per-claim deductible or against the applicable limit of liability. The limit and deductible are not triggered until an actual claim is made. This in effect expands the coverage provided to policyholders for potential claims. What should you look for in cyber coverage? Cyber coverage should include breach response services, network asset protection, cyber extortion (ransomware) expenses, proactive cyber-security resources, and other insurance program components. Effective coverage is available at reasonable rates. Services should be provided by experts experienced in cyber incidents, legal and notification requirements, IT forensics, and other cyber-related services. For more information, email CAMICO at inquiry@camico.com. Why should I not admit liability, assume damages, voluntarily make any payments, or incur claims expenses without the prior written consent of the insurance company? Policyholders should not take such actions without first receiving guidance from a risk adviser with the insurance company, or without the prior written consent of the company. Such actions will likely violate policy conditions, which may result in a denial of coverage. Avoid agreements that include “hold harmless” or indemnification provisions that are one sided and not in the firm’s favor. Firms that go along with clients in attempting to a handle problem internally without reporting it are sometimes surprised to find out later that the problem is much larger than it first appeared to be. If the problem was not reported timely in accordance with the policy, the claim might not be covered. Claims and potential claims should always be reported as soon as possible. Do not take any action on them without guidance from your risk adviser. If CAMICO determines that it is appropriate to retain legal counsel to assist with a potential claim situation, the legal expenses will be absorbed by CAMICO. Some insurance programs discourage policyholders from reporting problems by providing premium credits for claims-free status. This approach in effect encourages policyholders to handle potential claims on their own—a dangerous practice with potentially disastrous financial and reputational consequences for a CPA firm. CAMICO has always encouraged policyholders to report early so that disputes and potential claims have a better chance of being resolved early, enabling the firm to avoid time-consuming troubles and remain focused on servicing their clients. What practice and risk management tools and services are available with the CAMICO policy? Insurance alone is not a solution for reducing risks. That is why CAMICO’s program goes beyond just providing CPA insurance options. Policyholder firms have free, unlimited access to CAMICO’s proven approaches that have helped numerous CPAs build thriving ﬁrms and avoid damaging claims. Our focus on high-quality services, expertise, resources and tools—custom-designed for CPAs—distinguishes CAMICO as the preferred choice in the profession, and we continuously strive to earn that distinction. Visit the Risk Management section on the CAMICO website to learn more. Does CAMICO offer other CPA business insurance solutions? Disclaimer: This information is provided as a general overview and is not intended to be a complete description of all applicable terms and conditions of coverage. Actual coverages and risk management services and resources may change without notice and are subject to policy provisions as issued.